#2 Common is a very cost-effective grade of Cherry. All of the natural character of the lumber is allowed in this grade. The flooring has large knots, worm holes, color variation, white sapwood, and surface defects like cracks. #2 Common Cherry flooring is also referred to as Rustic Grade, Tavern Grade, Cabin Grade, and Character Grade. Standard pre-milled #2 Common American Cherry will have the shortest lengths in comparison to higher grades. Most flooring is in 7-foot bundles from 2¼″ to 5″ wide, or a custom-made long plank can be made. With a long plank, the lengths and widths are made specifically to each project’s specifications. The longest lengths can be from 10 to 14 feet, and the widths can vary from 2¼″ up to 12″. Moisture content is between 6% and 8% for quick acclimation. #2 Common Cherry is found prefinished or unfinished ¾″ solid or engineered with a veneer top layer. 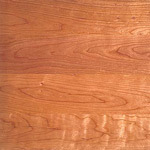 #2 Common grade American Cherry flooring is readily available. Custom orders usually demand 2–3 weeks for production, depending on lumber availability. Pre-milled standard 7-foot bundles are a stock item. #2 Common grade American Cherry will have a light reddish appearance with large amounts of white sapwood, large knots, and mineral streaks. The average lengths in 7-foot bundles are shorter than #1 Common with standard milling. A custom-made long plank can be ordered if longer lengths are desired. Cherry is extremely sensitive to sunlight and will darken considerably with an oil-based finish. A de-waxed shellac or lacquer should be first applied to protect the natural color of the wood. Also, water-based finishes can be applied to slow color change. #2 Common Cherry is moderately durable but resists denting and traffic wear much better than pine. Cherry is relatively stable in comparison to other species like Yellow Pine. Although a hardwood, #2 Common Cherry flooring works with little difficulty with both hand and power tools. When installing the flooring, it is best to use a manual nailer, but staples and pneumatic nailers work well. Rustic flooring installation may take more time than higher-grade flooring because the lengths of the boards are shorter typically. Some Rustic boards contain vertical splits, which can create problems when sanding and should not be installed. If any are found after installation, they should be glued or replaced. Cherry holds screws well, and it glues, stains, and polishes to a very attractive finish. It can be somewhat difficult to sand with flooring equipment because of its tight grain. Professional sanding and finishing is recommended. Because it is priced lower than Select, #2 Common Cherry flooring is used frequently in low-, medium-, and high-end projects. It is most popular in rustic camps as well as in contemporary structures.